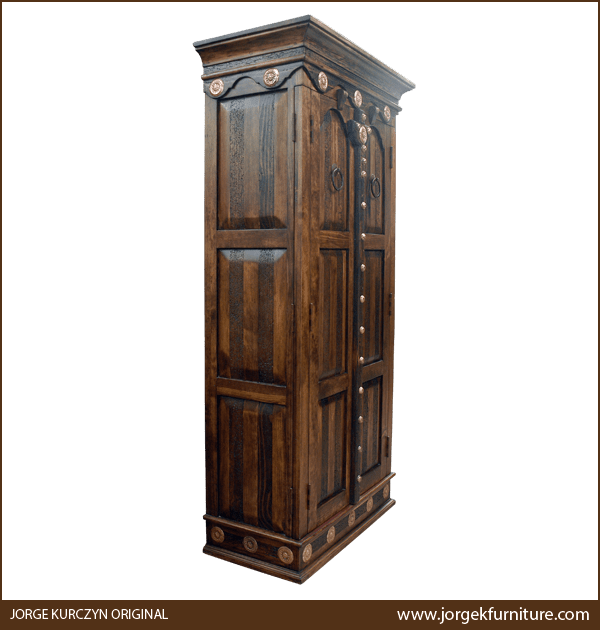 This spectacular, handcrafted, Spanish colonial style armoire has a staggered, solid wood, crown molding, and the area directly below the crown molding is adorned with a hand carved, colonial style, curved design. Intermittently hand tacked to the curved design are ornate, hand tooled, copper conchos. 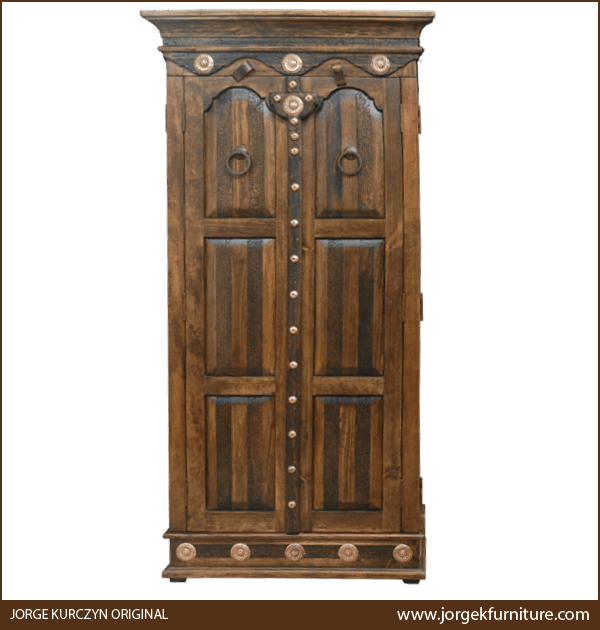 The front of the armoire has two, large, solid wood doors, and centered in the top of the doors is a luminous, hand tooled, copper concho, accompanied on each side by smaller, copper conchos. Each door has three, geometric shaped, vertical panels, and centered in each of the top, two panels is a large, hand forged, iron ring. The two doors are divided by intermittently hand tacked copper conchos that run from the top of the doors to the base of the armoire. All sides of the base of the armoire are also adorned with hand tooled, copper conchos. Each lateral side of the armoire has three, rectangular cut panels, and the armoire rest on sturdy, solid wood feet. It has an antique finish, and the inside of the armoire has a large area for cutomized shelving and drawers. The armoire is made with the best, sustainable, solid wood available, and it is 100% customizable.